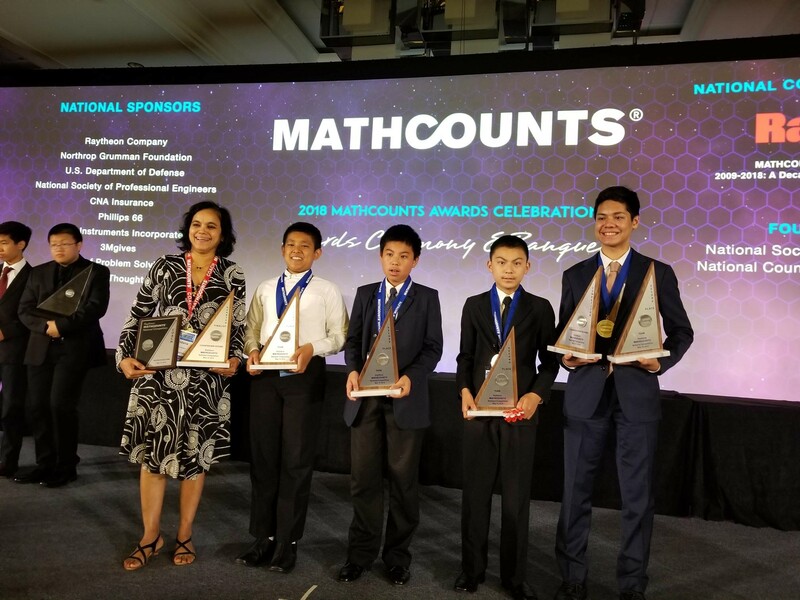 At last month’s MathCounts National Competition in Washington, D.C., the California team, featuring eighth grader Rishab Parthasarathy (pictured, second from left) and coached by middle school math teacher Vandana Kadam (far left), took second place overall. The event included 224 competitors from 56 teams, one from each of the 50 states and three U.S. territories (the Virgin Islands, Puerto Rico and Guam), as well as teams representing the District of Columbia, State Department and Department of Defense. All of the members of California’s team were among the top 10 percent. The second-place performance at MathCounts capped off a successful spring semester for middle school math students, who also had a stellar showing at the California Math League (CAML) contest in February, where all three middle school teams placed first in their region, which contains Placer, Santa Clara and Yolo Counties. Top scorers for grade 6 were Gautam Bhooma, Varun Fuloria, Emma Gao and Aniketh Tummala, who each scored 33 points, and Joe Li, Claire Luo, Julie Shi, Ella Yee and William Zhang with 31 points. In grade 7, Sally Zhu scored a perfect 35, Riya Gupta had 34 points and Tiffany Chang, Ashley Hu, Anthony Tong and Sabrina Zhu each earned 33 points. Eighth graders Alexander Hu, Rishab Parthasarathy, Kevin Wang and Gloria Zhu earned a perfect 35 points, while classmates Mark Hu, Angela Jia, Rohan Thakur and William Zhao scored 34. Esther Wu earned an impressive 33 points.